Generally, there are two schools of thought when it comes to holiday giving. One camp is all about the hunt for the perfect gift. It’s all about finding something that’s poignant, wanted and personal. Admittedly, this writer falls into that category. I can also tell you there is no better feeling than finding that level of sentimentality in the perfect gift that will surely have the recipient believing someone actually “gets them”. And yes, it’s time consuming and yes, there’s often not enough time to go on those sometimes long treasure hunts. The second camp – perhaps with a bit more sanity through practicality – can appreciate the versatility gift cards provide. Gift cards open up the whole world, or at least a specific retailer, in possibilities that allow the recipient to shop without worrying about their own budgets and what they should be spending their own money own. At a recent meeting, the term “guilt free happies” was used. Even if it doesn’t feel very personal, these really are the perfect gift for anyone. With the holidays just around the corner, we did our own impromptu survey and discovered that gift cards was at the top of the list for gift preferences. So, just in time for your holiday shopping, we take a look not only at gift cards, but prepaid cards, too. There are some distinct differences – and these are important. Here’s something many consumers don’t know – all of those new compliance regulations built into the 2009 CARD Act offer no protection for those using prepaid debit cards, also known as prepaid credit cards or reloadable prepaid cards. This is important for a few reasons. First, more consumers than ever are using these prepaid products. There’s a trend out there that suggests more Americans are becoming underbanked or unbanked. They need a viable product that will keep them from having to carry and use cash and a prepaid card is a great solution. Again, because these products aren’t covered under the new laws, they can still leave consumers vulnerable in ways that checking accounts or traditional credit cards don’t. The good news with prepaid cards is they’re protected if you lose them or if they’re stolen. In fact, if you’re using Visa, MasterCard or AMEX prepaid cards, odds are, you’ll enjoy the same protection the networks provide their other credit card accounts. It’s important to understand what’s covered and what’s not covered. As mentioned, the versatility found in gift cards is perfect for holiday, birthday, graduation and any other kind of gift. It allows the recipients to shop for those things they want or need and maybe wouldn’t take from their own budgets to buy. 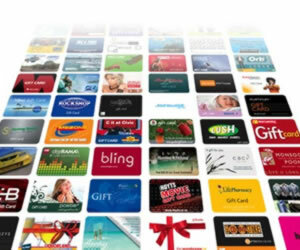 Some gift cards are exclusive to retail stores while other general purpose gift cards can be used anywhere the logos are displayed. For instance, Visa gift cards can be used anywhere a shopper sees the Visa logo. School starts next week and I need to buy the kids school supplies. I’ve gained twenty pounds over the past few years and there’s nothing in a Victoria’s Secret store that would make me feel good about myself. There is a huge surge in prepaid cards on the market these days. They are as different as a zebra and a horse, so making sure you understand the terms and conditions is crucial. Fee structures vary greatly, as do ATM fees, transaction fees, monthly usage fees – the list goes on and on. That said, these cards are very flexible since they can be used anywhere. A word of caution: there are sometimes different compliance issues you need to be aware of. For instance, if your prepaid card lies dormant, the fees can begin to stack up. That can dwindle your balance fairly quickly. That’s not always the case, though, so be sure to check that small print. The AccountNow card is a great example of how a low fee prepaid debit card should work. This prepaid Visa has no monthly fee, no overdraft fees and no minimum balance requirements. You can take advantage of the free direct deposit and online bill payment features, too. The best part is the new purchase rewards program the card recently rolled out. It’s a great choice for a prepaid card and is ideal for those who only occasionally use a prepaid product. There’s a reason the gift card industry rakes in more than $50 billion a year. That’s no easy feat, especially in a troubled economy. The government has really honed in on the limitations issuers can place on their gift card products. If it’s possible, this makes it an even more perfect choice. There are limits on how much the card network can charge for this like dormant fees and there were also guidelines put into place regarding expiration dates. Many still have limitations in place and the government didn’t ban them completely, it just updates the laws so that there’s more time for the users to actually their gift cards. The CARD Act prohibits inactivity or service fees in the first year, and after that, only one fee per month can be assessed. Further, you might also have a small fee when you purchase the card, but that’s just the price of gift shopping. Bottom line, the protections vary from gift cards to prepaid cards and while both serve their purpose as a gift, to ensure your recipient is able to use the card as he or she sees fit, be sure it’s a true gift card. Do you give gift cards as birthday, Christmas or other gifts? Any favorites you prefer to give? Let us know your thoughts.